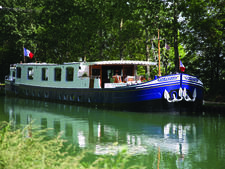 The four-passenger Alouette was built in 1908 in Oudekerk, Netherlands and converted in a hotel barge in 1986 (the most recent refurb took place in 2008). 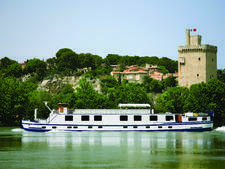 Alouette offers cruises in Provence, France, along the 17th century Canal du Midi. There are two cabins onboard, one 260 square feet, the other 205 square feet, both of which can be set up with two single beds or one double. Amenities include hairdryer, satellite TV and DVD player, and safe. Bathrooms are shower-only. 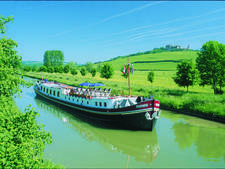 Cruises include all meals with local wine, all shore excursions (guided tours to historic sites like the Carcassonne, the incredible walled medieval city), an open bar and bikes for passenger use. Optional excursions, including hot air balloon rides, canoe trips and golf, are extra. Public spaces include a saloon with Hi-Fi sound system, and a sun deck with loungers. 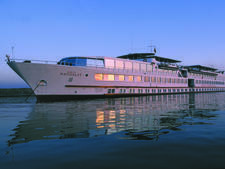 The ship features air conditioning throughout. 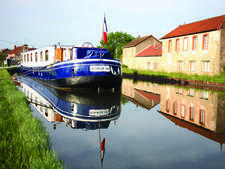 A four-person crew is comprised of a pilot, chef, tour guide and hostess.